South Gallia sophomore Amaya Howell (2) drives past Southern sophomore Phoenix Cleland (1), during the Lady Rebels’ 43-25 victory on Thursday in Racine, Ohio. RACINE, Ohio — From start to finish, it was the Lady Rebels’ night. 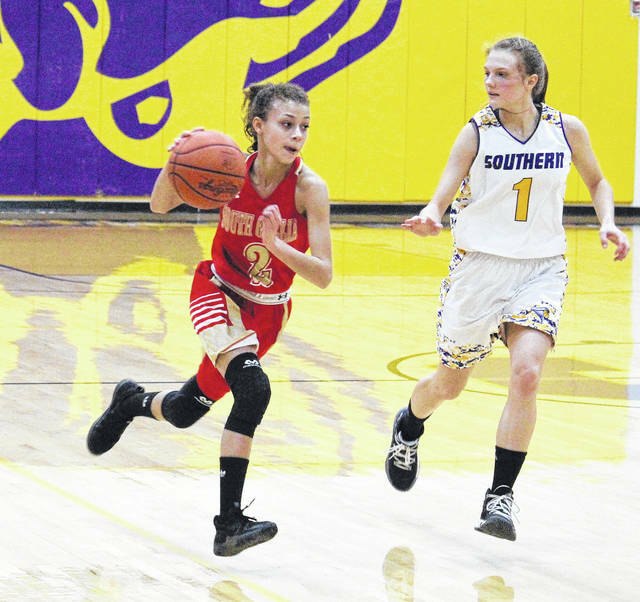 The South Gallia girls basketball team outscored Tri-Valley Conference Hocking Division host Southern in each of the four quarters on Thursday night in Meigs County, as the Lady Rebels picked up their first league win of the season by a 43-25 count. South Gallia (2-6, 1-5 TVC Hocking) hit seven field goals over the first eight minutes of play and led Southern (1-6, 1-5) by a 16-to-6 margin. The Lady Tornadoes’ best offensive quarter of the night was the second, in which they scored eight points. SGHS scored 10 points in the second, however, and headed into the half with a 26-14 lead. South Gallia extended its lead to 33-18 headed into the finale, scoring five of its seven third quarter points from the charity stripe. Over the final eight minutes the Lady Rebels hit six free throws, closing out the 43-25 victory with a 10-7 run. For the game, the Lady Rebels held a 35-to-24 rebounding advantage, while winning the turnover battle by a 28-11 count. South Gallia collected seven steals in the win. As a team, Southern recorded eight assists. From the free throw line, the Lady Rebels shot 17-of-32 (53.1 percent) and the Lady Tornadoes were 3-of-8 (37.5 percent). SGHS senior Erin Evans hit the guests’ only three-pointer and led the victors with 16 points, coming on five field goals and five free throws. Olivia Hornsby and Amaya Howell scored eight points apiece for the Red and Gold, with Hornsby marking a team-best four steals. Aaliyah Howell had six points for the Lady Rebels, while Christine Griffith recorded four points and a game-high 13 rebounds. Kiley Stapleton rounded out the winning total with one marker. SHS senior Shelbi Dailey led the hosts with six points on a trio of field goals. Phoenix Cleland and Paige VanMeter had five points apiece in the setback, with Cleland earning team-highs of eight rebounds and three assists. Jaiden Roberts finished with four points, Baylee Wolfe and Bailee Floyd added two apiece, while Lauren Lavender scored one point. VanMeter and Roberts both sank a three-pointer in the contest. These teams are scheduled to meet again on Feb. 1 in Mercerville. Both squads have one game left in 2017, as the Lady Tornadoes visit Sciotoville East on Dec. 28, and the Lady Rebels host Ohio Valley Christian on Dec. 29.